Create big, beautiful blue eyes with these Blue Dolly Eye Contact Lenses. These contacts have a dramatic design that really opens up the eye area. They make your eyes look bigger, brighter and more intense. 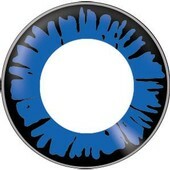 Dream Eye Dolly Blue Contact Lenses are fashion lenses with a difference. They are specially designed to give you a cute, wide-eyed look. These Contact Lenses are light, soft and comfortable to wear. Their 42% water content ensures that your eyes stay hydrated and feel fresh all day. Ideal for Halloween, fancy dress and statement fashion.